Tonight I went for a 4 mile run after work. It was 43 degrees outside so I got to run in shorts again! My quads were feeling pretty tired today, after yesterday’s faster (for me) paced run. They better get their act together because I have a hard, hilly run planned for tomorrow. When I started my run today, I saw Mr. Boy (the jack russell that lives down the road that occasionally runs with me) out in a field running around like a maniac. I wondered what he was doing… and then I saw the skunk. Right as I ran by on the road, Mr. Boy ran up behind the skunk barking and I saw that skunk’s tail go up in the air. Poor Mr. Boy got sprayed and then there was a lot more barking and some growling. Hope he keeps his distance because he’s going to stink for awhile. A little further on during my run, I spooked a field full of dairy cows. They’re so funny when they decide they need to run as fast as they can away from the fence, just because someone goes by. I also ran past a field that had some beef calves in it. They were all right at the fence and when I ran by, only about 3 feet from them, they took off running. 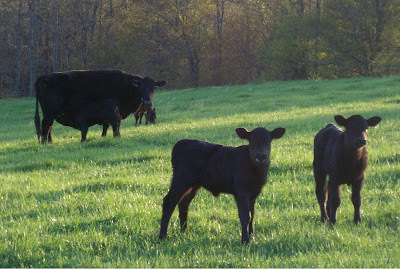 There were grown cows in the field, too, that just stood there and looked at me and watched the calves go running. The sun set with about 1/2 a mile to go and it got chilly out. I was also worried about cars being able to see me, since I didn’t wear my reflective vest today. Every time a car went by I got in the grass along the road as best I could. When I got back to our road I was worried that skunk would still be around. It was an all black skunk and with the sun down it was hard for me to see. Luckily I did not see him, and thus avoided smelling like Mr. Boy currently smells. We will need to bring this to the fos focus guys and girls.